Hmm... how about looking at these hotness overload of Channing Tatum photos. I can't wait to see him again on Magic Mike XXL. 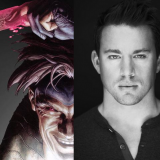 ...and he'll be playing on the big screen as Gambit too. . soon..